Sign up to stay informed about our work and opportunities to be a part of this initiative. A perplexing challenge has perennially vexed the urban forestry community: With all the benefits we know urban forests provide, what is the most important issue to talk about when we’re trying to draw broad audiences under the urban forest canopy? Four years of work by a national task force and the Sustainable Urban Forests Coalition (SUFC) points to a surprising answer: All of them. In 2010, the United States Forest Service and the New York Restoration Project partnered to launch the Vibrant Cities and Urban Forests Task Force. This group of 25 experts was drawn from across the nation and represented a broad range of disciplines. It convened to advance conversations and bolster efforts that have been taking place for years aimed at developing strategies to more effectively support urban ecosystems, and in particular urban forests. The charge was to define what characteristics make a community “vibrant,” and how enhancing urban forestry at all levels can positively impact quality of life. To do so, the Task Force took an expansive view of urban forestry, looking far beyond the trees themselves to evaluate issues such as health and social services, landscape design and architecture, economics and social justice, green infrastructure and heat island effects, and many others. Following the release of the report, the SUFC, in partnership with its members and consultants, took on the mission of sharing and promoting the Vibrant Cities recommendations among the broader urban forestry community – and beyond. The results of this work offer new insights and provide some easily replicable lessons learned for any organization interested in promoting urban forestry, regardless of their perspective, approach or core mission focus. If the results of SUFC’s outreach to both the traditional urban forestry community and “near in” stakeholders demonstrates anything, it’s that – when properly presented – an instant connection can be made between healthy urban forests and virtually any other issue of interest to community advocates. With a modest outreach budget, SUFC was able to build connections to the Vibrant Cities content with a diverse array of audiences on issues ranging from creating effective public works projects to urban planning to environmental justice. 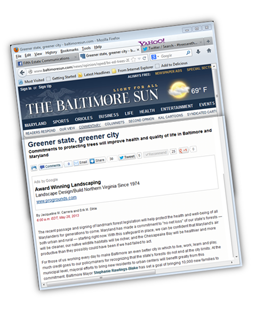 Thought-provoking and action-inspiring articles and blog posts appeared in such outlets as the Baltimore Sun, the American Planning Association Sustaining Places blog, the American Public Works Association’s APWA Reporter and the National Recreation and Parks Association’s Parks and Recreation. In addition, several organizations adopted Web and presentation content developed to support the Vibrant Cities report through an online toolkit, and hundreds of social media posts have been generated by an expansive group of Twitter and Facebook users. In short, from a communications perspective it is a relatively “easy lift” to make the case for urban forests, almost regardless of the audience. Finally, from the very earliest discussions with members and stakeholders, SUFC heard loud and clear from the community that there was no appetite for a new grand initiative or a new place to send the public for urban forestry information. Indeed, several SUFC members and other organizations have their own constituencies to tend to and their own campaigns to promote. What SUFC heard was a need for tailor-made tools to advance the work organizations were already doing. This finding dovetailed perfectly with the structure of the Vibrant Cities report. Because the report provides multiple points of access into urban forestry advocacy through its 12 distinct recommendations, it was a natural step for the SUFC outreach team to build modular, customizable materials. This “open source” approach provided a tangible added value to urban forestry organizations: Readymade content that could be adapted to existing materials to expand their impact. Although SUFC is winding down its active communications support for the Vibrant Cities report, Coalition member Alliance for Community Trees has agreed to maintain the online toolkit as a community resource. Most important, however, is the fact that from top to bottom, the Vibrant Cities Task Force process demonstrates clear proof of concept that achieving a “changed, shared consciousness” about our urban ecosystems and urban forests is not a distant aspiration, but an achievable goal that the community can collectively and strategically approach. 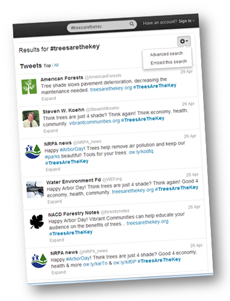 In a sense, every urban forest advocate has always known that trees are the key. Thanks to the work of the Vibrant Cities Task Force, we now we have a much clearer understanding of how to use them to unlock every community’s potential.